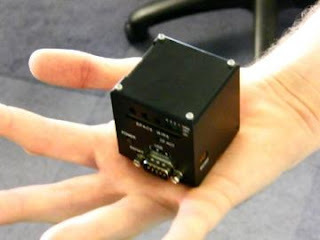 Shimafuji Corporation has developed the Space Cube, a 2x2 inches PC designed for use in space to control various electronics and manage an "interstellar computer network." 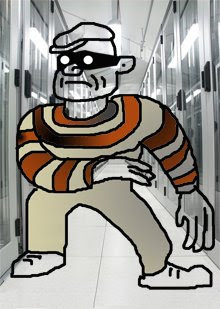 Running on just 5 Watts, the PC has a 300 MHz CPU, 16 MB of on-board flash memory, 64MB SDRAM card, LAN port, USB port, Ethernet port, and VGA monitor connector. The final phase of Android Developer Challenge I is now complete. Out of 50 teams of finalists, 10 teams received a $275,000 award each and 10 teams received a $100,000 award each. All of the teams' hard work during the past several months is apparent in the final 50 entries. The teams have each provided overviews of their applications and the technologies they used to create them; learn about all 50 applications and the teams that created them here in their own words. 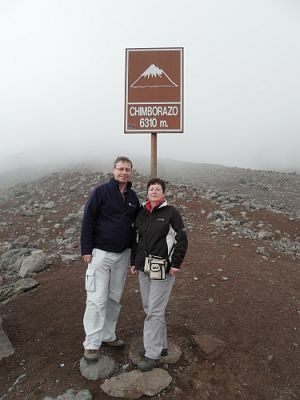 Easy to use image editor that enables you to quickly personalize your pictures and share them with friends or photo sites. A tiny gripper that responds to chemical triggers could be a new tool for surgery. A tiny handlike gripper that can grasp tissue or cell samples could make it easier for doctors to perform minimally invasive surgery, such as biopsies. The tiny device curls its "fingers" around an object when triggered chemically, and it can be moved around remotely with a magnet. Minimally invasive, or "keyhole," surgery currently involves making several centimeter-size incisions and inserting surgical tools through hollow tubes placed in these incisions. Wires connect the tools to external controls that a surgeon uses to operate inside the body. This is less damaging than conventional surgery, but it limits a surgeon's ability to maneuver the instruments. The new technology is a step toward surgical tools that move more freely inside the human body. "We want to make mobile surgical tools," says David Gracias, a biomolecular- and chemical-engineering professor at Johns Hopkins University, who led the development of the new gripper. "The ultimate goal is to have a machine that you can swallow, or [to] inject small structures that move and can do things [on their own]." A gripper based on the current design could respond autonomously to chemical cues in the body. For example, it might react to the biochemicals released by infected tissue by closing around the tissue, so that pieces can be removed for analysis. As travel costs rise and airlines cut services, large and small companies are rethinking business travel and face-to-face meetings. The technology has matured to the point where it is often practical, affordable and more productive to move digital bits instead of bodies. The emerging trend goes well beyond a reaction to rising travel costs and weakening economies. Past predictions that technology could replace travel have been frequent and premature. The main difference today is that the technology is finally catching up to its promise. There's no single breakthrough - rather a series of advances in telecommunications networks, software and computer processing. The results can be seen not only in the expensive new telepresence systems, but also in more mainstream collaboration technologies - Web conferencing, online document sharing, wikis and Internet telephony. Companies of all sizes are beginning to shift to web-based meetings for training and sales presentations. Of course, face-to-face meeting are not obsolete. It's simply that digital tools are making business travel more selective. A recent report estimates that up to 20% of business travel could be replaced by videoconferencing today. A range of companies offer the mainstream online communications and collaboration tools: WebEx, Citrix, Microsoft, IBM and others, plus top-end products from Cisco, HP and Polycom. Completed telepresence rooms, typically with three huge curved screens (and a fourth screen above for shared work), custom lighting and acoustics, cost up to $350,000. That cost is rapidly decreasing. With more than 200 telepresence rooms, CISCO says it is avoiding $100M in annual travel costs, and reducing greenhouse gas emissions from air travel by 10%. HP says air travel for offices with telepresence rooms is down 25%. The paradox in "telepresence" is that it stimulates the richest form of human interaction: people talking to each other, face to face. But, many agree that it is not a perfect substitute. You don't learn about other cultures with telepresence. You get things from being there, over breakfast and dinner, building relationships face-to-face. Some years ago, I made a televised speech from San Diego to a conference in Australia. That could not compare with the level of personal interaction and enjoyment I achieved during my recent Australia trip. The travel time was about 14 hours each way. But, the personal interaction was worth the journey. Mercer's survey covers 143 cities across six continents and measures the comparative cost of over 200 items in each location, including housing, transport, food, clothing, household goods and entertainment. It is the world's most comprehensive cost of living survey and is used to help multinational companies and governments determine compensation allowances for their expatriate employees. 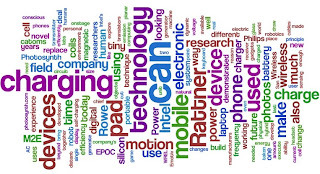 Picture on the right is created with Wordle. Gives very nice impression what it is all about. E.g. you can use it on your own c.v. and include this at the beginning of your c.v.
Intel Corporation's chief technology officer took a fascinating look at how technology will bring man and machine much closer together by 2050. Justin Rattner, during his keynote today at the Intel Developer Forum in San Francisco, predicted big changes are ahead in social interactions, robotics and improvements in computer's ability to sense the real world. He said Intel's research labs are already looking at human-machine interfaces and examining future implications to computing with some promising changes coming much sooner than expected. "The industry has taken much greater strides than anyone ever imagined 40 years ago," Rattner said. "There is speculation that we may be approaching an inflection point where the rate of technology advancements is accelerating at an exponential rate, and machines could even overtake humans in their ability to reason, in the not so distant future." 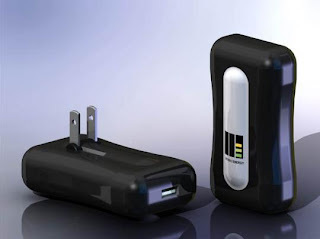 Imagine being able to walk into an airport or room with your laptop and instead of consuming battery, it is recharged. Based on principles proposed by MIT physicists, Intel researchers have been working on a Wireless Resonant Energy Link (WREL). Rattner demonstrated powering a 60-watt light bulb without the use of a plug or wire of any kind, which is more than is needed for a typical laptop. The magic of WREL is that it promises to deliver wireless power safely and efficiently. The technology relies on strongly coupled resonators, a principle similar to the way a trained singer can shatter a glass using her voice. At the receiving resonator's natural frequency, energy is absorbed efficiently, just as a glass absorbs acoustic energy at its natural frequency. With this technology enabled in a laptop, for example, batteries could be recharged when the laptop gets within several feet of the transmit resonator. Many engineering challenges remain, but the company's researchers hope to find a way to cut the last cord in mobile devices and someday enable wireless power in Intel-based platforms. 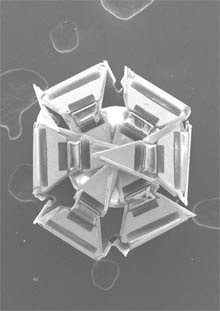 Intel researchers are also investigating how millions of tiny micro-robots, called catoms, could build shape-shifting materials. 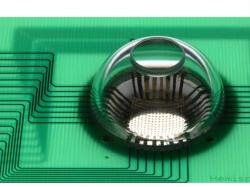 If used to replace the case, display and keyboard of a computing device, this technology could make it possible for a device to change physical form in order to suit the specific way you are using it. A mobile computer, for example, could be tiny when in a pocket, change to the shape of an earpiece when used as a mobile phone, and be large and flat with a keyboard for browsing the Internet or watching a movie. Rattner described this as a difficult exploratory research agenda, but steady progress is being made. 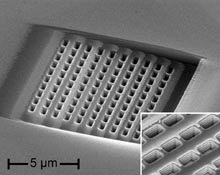 He demonstrated for the first time the results of a novel technique for fabricating tiny silicon hemispheres using photolithography, a process used today to make silicon chips. This capability is one of the basic structural building blocks needed to realize functional catoms, and will make it easier to bring the necessary computational and mechanical components together in one tiny package less than a millimeter across. The technique is compatible with existing high-volume manufacturing and enables the possibility to produce such catoms in quantity at some point in the future. Dr. Michael Garner, program manager of Emerging Materials Roadmap, joined Rattner onstage to discuss the importance of research of novel silicon technology, keeping Moore's Law alive and well through the next decade and beyond. Among other things, Intel is researching how to go beyond planar transistors to 3D transistors and is looking at using compound semiconductors to replace silicon in the transistor channel. Looking further out, Intel is exploring into a variety of non-charge-based technologies that could one day replace CMOS altogether. Robots today are primarily used in the factory environment, designed to perform a single task repeatedly and bolted down. To make robotics personal, robots need to move and manipulate objects in cluttered and dynamic human environments, according to Rattner. They need to be cognizant of their surroundings by sensing and recognizing movement in a dynamic physical world, and learn to adapt to new scenarios. Rattner demonstrated two working personal robot prototypes developed at Intel's research labs. One of the demonstrations showed electric field pre-touch that has been built into a robot hand. The technique is a novel sensing modality used by fish but not humans, so they can "feel" objects before they even touch them. The other demonstration was a complete autonomous mobile manipulation robot that can recognize faces and interpret and execute commands as generic as "please clean this mess" using state-of-the-art motion planning, manipulation, perception and artificial intelligence. In addition to robots becoming more human-like, Rattner said he believes more innovation will emerge to make human and machine interaction more robust. Randy Breen, chief product officer of Emotiv Systems, joined Rattner onstage to demonstrate the company's EPOC* headset. The Emotiv EPOC identifies brainwave patterns, processes them in real time and tells a game what conscious or non-conscious thoughts the user has had, like facial expressions, conscious actions or emotions. A user with the headset could think about smiling or lifting an object, and an avatar in a game would execute it. EPOC can currently identify more than 30 different "detections" through the 16 sensors on the headset. People today own and use an increasing number of portable electronic devices such as mobile phones, digital cameras, MP3 players or handheld computers. Each with its own battery and adaptor for recharging. How much more convenient would it be if you didn’t have to deal with all those different adaptors, connectors and cables? But instead have a single wireless charging unit that would keep all your portables powered up, so that you never miss an important call on your mobile phone or that perfect shot with your digital camera? Philips Research is working on a wireless power system that is very intuitive and convenient in use for charging mobile electronic devices. It consists of a tablet, the size of a mouse pad, which allows you to simply place your mobile device on it to charge it –hassle-free with no cables or plugs to contend with. The wireless charging pad can be used in the home or office but also in the likes of hotel rooms or on trains and airplanes. 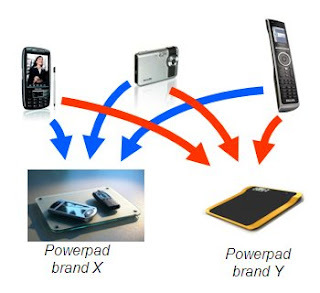 The charging pad uses the principle of magnetic induction, which is also used for the current Philips electronic toothbrush. It consists of a matrix of charger coils that can generate an alternating magnetic field. The mobile devices contain a receiver coil in which a voltage is induced. This voltage is used to power the device and its battery. The transmitter and the receiver coil basically consist of planar, spiral windings, typically made of printed circuit boards (PCB) tracks. To enhance the efficiency of the system and to reduce the emission of the magnetic field to a minimum, the transmitter coils in the charging pad can be switched locally so that only those close to a device on the charging pad are active. A sensor circuit is used to detect where the device is placed on the charging pad. This means that the charging pad can be scaled to any size, without loss of efficiency. To ensure that the power pad can charge all kind of portable electronic devices from different brands, both the portable devices as well as the charging pads have to comply with a universal interface. 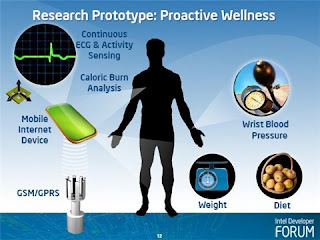 For this reason, Philips is initiating cooperation with other companies to develop a standard for this technology. Eurovia werkte een thermochrome bekleding uit die in real time ijzel op de weg detecteert. Gripverlies op een beijzelde weg kan ernstige ongevallen veroorzaken. Voor automobilisten is het bijgevolg belangrijk dat ze weten dat het wegdek er bevroren bij ligt. Dat is ook zo voor de zoutstrooidiensten, die dan tijdig kunnen uitrukken. Al in 1999 gaf Techniline toelichting bij Franse research met betrekking tot het gebruik van thermochrome polymeren bij het toezicht op de staat van wegen tijdens vorstperiodes. Vandaag biedt de fabrikant van wegbekledingen (FR) (Vinci-groep) een temperatuurgevoelige indicator aan om het gevaar voor ijzel te visualiseren. Dat kleurloos vernis verandert snel en omkeerbaar van kleur bij een temperatuur van 1°C. Het gaat om een monocomponentpolyurethaanhars in waterige fase dat een thermochroom additief bevat dat blauw of rood wordt. Die hars kan op elke heldere drager (beton, hout, metaal, …) worden aangebracht, zowel op een verticaal als horizontaal oppervlak, met behulp van klassieke werkwijzen: penseel, borstel of lagedruksproeier. Momenteel test Eurovia op de weg de doeltreffendheid en de duurzaamheid van de bekleding uit. Twee pilootoperaties op ware grootte zijn in uitvoering. De hars wordt in de vorm van grote patches aangebracht op gevoelige plaatsen (viaducten, zones blootgesteld aan krachtige wind…); ze zijn zeer zichtbaar voor automobilisten en toezichthoudend personeel. This watch design could reinvent our whole perception over watches. The projects comes from a design contest organized by Timex to get new ideas for their future projects. 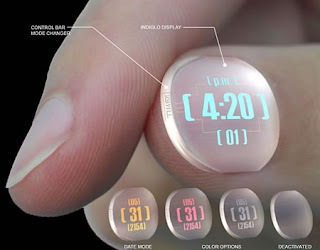 The Nail Watch, as they naturally called it, allows you to check the time with just a quick glance over your arm. It can be turned on or switch colors by pressing on the top of your nail. We can only imagine what sort of technologies the manufacturers would have to use to stick it to your nail, or where would they place the batteries or even circuits. However, I think it would revolitionize the entire watch industry if it would hit the market. The TX54 took runner up in the Timex 2154 Future of Time competition. It’s a concept piece billed as “a disposable timepiece that is worn on the user’s thumbnail. While its translucency makes it blend seamlessly with the hand, a selection of text color options and a glow feature that activates on command make it easy to read.” It appears that you use the end of the nail to cycle through options and modes while the time is displayed on the main part of the nail. It’s kind of a cool idea, no? If it’s supposed to be disposable, too, then it probably wouldn’t cost all that much. Would you buy one? Joe Trippi, Howard Dean's 2004 presidential campaign manager and Internet impresario, describes Super Tuesday II--the March 4 primaries in Texas, Ohio, Vermont, and Rhode Island--as the moment Barack Obama used social tech­nology to decisive effect. The day's largest hoard of dele­gates would be contested in Texas, where a strong showing would require exceptional discipline and voter-education efforts. In Texas, Democrats vote first at the polls and then, if they choose, again at caucuses after the polls close. The caucuses award one-third of the Democratic delegates. Hillary Clinton's camp had about 20,000 volunteers at work in Texas. But in an e-mail, Trippi learned that 104,000 Texans had joined Obama's social-­networking site, known as MyBO. MyBO and the main Obama site had already logged their share of achievements, particularly in helping rake in cash. The month before, the freshman senator from Illinois had set a record in American politics by garnering $55 million in donations in a single month. In Texas, MyBO also gave the Obama team the instant capacity to wage fully networked campaign warfare. After seeing the volunteer numbers, Trippi says, "I remember saying, 'Game, match--it's over.'" Het Nederlandse Winkwaves onthult een Web 2.0 sociaal platform voor bedrijven. Het Kenniscafé zou het koffieautomaatgevoel terug moeten brengen. 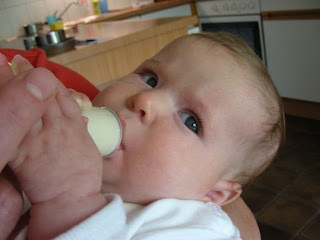 Het Kenniscafé, vanaf woensdag beschikbaar, is een standaardproduct voor het intranet van kleine en grote bedrijven. Het is de bedoeling om werknemers meer met elkaar in contact te brengen en de kennisdeling te vergroten. "Je krijgt eigenlijk een soort combinatie van Hyves, Twitter en Delicious, de bekende populaire 2.0-diensten, gecombineerd met documentmanagement. Maar dan helemaal gericht op de zakelijke omgeving", licht Rene Jansen van Winkwaves toe. Volgens hem is sociaal netwerken voor bedrijven 'een heel goede manier om mensen met elkaar in contact te brengen'. Hij doelt dan vooral op werknemers die op een andere afdeling, verdieping of filiaal werken. Dat zou als voordeel hebben dat door de kennisdeling via het sociale netwerk de innovatie in de hand wordt gewerkt. Note Ary: Look at the mentioned presentation! 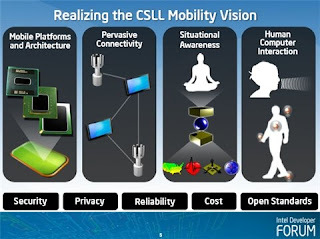 The Intel Developer Forum kicks off Tuesday and the company has started with a few “day 0″ presentations–including one on research on how mobile devices that can sense and adapt to you–that are worth a look. Intel released three presentations and the most interesting one–and potentially problematic–comes from Mary Smiley, director of Intel’s emerging platforms labs. The general concept goes like this: Mobile devices will learn you, know what situation you’re in, gauge the environment and infer what you need. Smiley’s primary example looked out how these smart devices would apply to the health care industry. All of those sensors may have a big health care benefit, but you could argue that it also has “nag” written all over it. Devices will tell you you’re too fat, shouldn’t eat that steak and need to exercise more. I have a lot of rugby and offensive line pals that may just throw this “proactive wellness” prototype out the window (or worse). 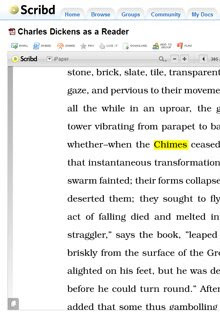 Luckily, my girthy pals don’t have to worry about this scenario anytime soon–there’s a lot of architecture work ahead. Here’s a look at the moving parts for these pervasive sensor-driven devices of the future. This architecture could have ramifications for everything from social networking to wellness to mobile augmented reality. 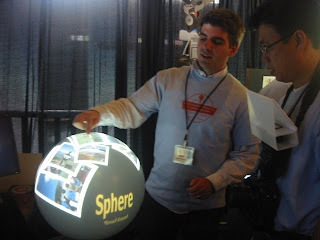 Sphere is an interactive spherical display prototype that uses custom optics hardware as well as computer vision and graphics software to enable interaction on a spherical surface. Our prototype device builds on a commercially available globe projection system (Global Imagination’s Magic Planet). We have added touch-sensing capabilities with an infrared camera that shares the optical path with the projector. This novel configuration permits us to enclose both the projection and the sensing mechanism in the base of the device and allows for easy 360 degrees access to the device and high degree of interactivity without shadowing or occlusion problems. 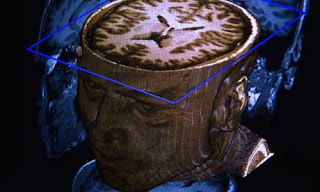 We have also developed a custom graphics projection pipeline that solves the distortion problems and enables projected data to be correctly visualized on the curved surface. The applications developed for Sphere currently include a picture and video browser, interactive globe visualization, finger painting, globe visualization, and an omni-directional video-conferencing application (360 degree panoramic video from Microsoft RoundTable device). These applications are designed for highly interactive public space environments (e.g., museums, lobbies, information booths) and highlight the appeal of the device as well as its visualization and interaction capabilities. While the International Olympic Committee is busy trying to catch today's performance enhancers, athletes are already looking for the next big boost that will give them the edge in 2012. Most of the positive doping tests in Beijing -- and the IOC president estimates there will be as many as 40 -- will likely be for steroids and the blood-boosting hormone erythropoietin, known as EPO. 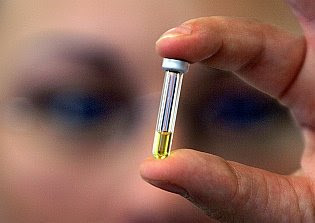 But the future of doping could get a lot more complicated. Here are some of the most promising -- or threatening, if you're the World Anti-Doping Agency -- candidates for the next Olympics. With all the crazy, complicated doping schemes out there could the journey to the top of the podium simply require a trip to the grocery store? Mooi weer en weer eens genoten van de prachtige omgeving van Uden. Van huis uit via bezoekerscentrum Slabroek naar Fons en Hannie gelopen in Nistelrode, om hun nieuwe huis te bekijken. 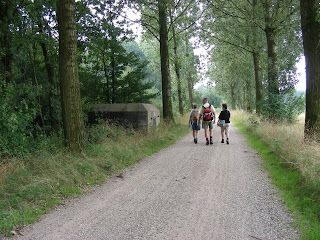 Behoorlijke wandeling door de Maashorst van ongeveer 8 kilometer. Daarna weer naar huis, door het bos, via de wildbrug en lang het golfterrein de Leemskuilen. Mooi weer, mooie omgeving, mooi huis. Freebase, shows how contextual connections can be made with machine readable data to provide a much richer results set which in turn can spawn fascinating visual representations, and more. Freebase is the foundational 800lb gorilla in the semantic space, quietly building momentum to create a ‘global knowledge base: a structured, searchable, writeable and editable database built by a community of contributors, and open to everyone….It could be described as a data commons’. Still technically in alpha, Freebase will be the underpinnings of many future companies - some would say this approach is the future of the entire Internet. It’s built by the community and for the community – free for anyone to query, contribute to, build applications on top of, or integrate into their websites - basically an open database of the world’s information. Communes didn't die at the end of the '60s. They grew up to be cohousing, a new kind of participatory community that's attracting increasing numbers of Boomers as they enter their 60s. Cohousing units are individually owned, like condos. But residents of the eco-friendly communities share communal resources and facilities, which helps them be energy-efficient. 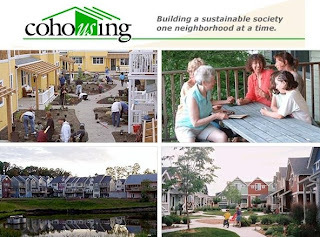 When we first wrote about cohousing in 2003, there were 60 such communities in the U.S. 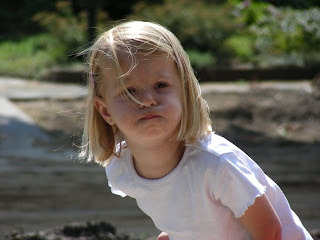 In 2008, there are at least 100, with 300 more in development (Columbia News Service 5.11.08). Properties range from Songaia Cohousing Community's 11-acre spread outside Seattle to the two-block Eco-Village apartments in Los Angeles. The current senior housing model — from home to assisted living to nursing home — won't cut it for many Boomers, who've had a sneak peak while helping their parents. Cohousing lets them rewrite the future by coming full circle with their youthful ideals. No longer a luxury, building green is rapidly becoming a necessity. For eco-savvy Boomers, sustainable cohousing is a big draw. Boomers who pool their resources can stretch their retirement funds. Soms kom je iets tegen, waarvan je je afvraagt waarom het niet eerder bekend is. Soople.nl is in eerste instantie gemaakt voor mijn moeder, die, hoe handig ze ook is met computers, nog niet op de hoogte was van alle mogelijkheden van Google. Met haar zullen er wellicht nog vele anderen zijn die niet bekend zijn met alle slimme functies van Google. Deze site is dus gemaakt om mensen bekend te maken met alle functies van Google. Het kan veel meer dan het op eerste gezicht oogt. Vele mensen weten bijvoorbeeld niet dat je met Google je zoekacties kan verfijnen tot soort document, soort site of tot een specifieke site. Tevens zijn er vele andere handige functies die Google biedt; het zoeken in het laatste nieuws (Engels), het opzoeken van definities (Engels), het gebruik van Google als geavanceerde rekenmachine of als vertaalmachine. University of Illinois at Urbana-Champagne researchers have built a hemispherical digital-image sensor that can take wide-angle pictures without distortion by mimicking the curves of a human retina. They attached an array of silicon photodiodes on a curved "retina." The technology may make it possible to give the curved surface of a human retina a coat of digital sensors, helping blind people see again. 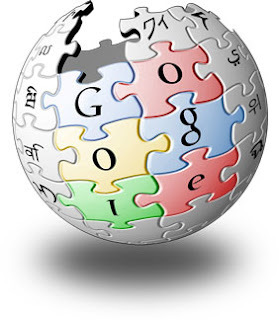 SAN FRANCISCO--Google opened its website Knol to the public on Wednesday, allowing people to write about their areas of expertise under their bylines in a twist on encyclopedia Wikipedia, which allows anonymity. "We are deeply convinced that authorship--knowing who wrote what--helps readers trust the content," said Cedric DuPont, product manager for Knol. The name of the service is a play on an individual unit of knowledge, DuPont said, and entries on the public website, are called "knols". Google conducted a limited test of the site beginning in December. Knol has publishing tools similar to single blog pages. But unlike blogs, Knol encourages writers to reduce what they know about a topic to a single page that is not chronologically updated. "What we want to get away from is 'this last voice wins' model which is very difficult if you are a busy professional," DuPont said. Google wants to rank entries by popularity to encourage competition. For example, the first knol on "Type 1 Diabetes" is by Anne Peters, director of the University of Southern California's Clinical Diabetes Programs. As other writers publish on diabetes, Google plans to rank related pages according to user ratings, reviews and how often people refer to specific pages, DuPont said. Knol focuses on individual authors or groups of authors in contrast to Wikipedia's subject entries, which are updated by users and edited behind the scenes. 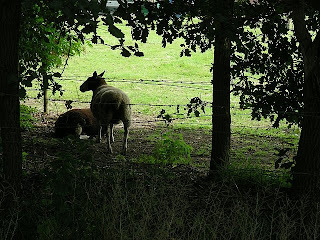 Knol does not edit or endorse the information and visitors will not be able to edit or contribute to a knol unless they have the author's permission. Readers will be able to notify Google if they find any content objectionable. Knol is a hybrid of the individual, often opinionated entries found in blogs and the collective editing relied on by Wikipedia and other wiki sites. A new tool for embedding documents on Web pages is cropping up on sites as diverse as the storage service Drop.io; LabMeeting, a social network for scientists; and the Obama campaign's official blog. Launched earlier this year, the format, called iPaper, is technology from Scribd, a company that hopes to become the sort of clearinghouse for documents that YouTube is for videos. With iPaper, the company offers a browser-based system for viewing documents that retains their original formatting and can be employed by the 98 percent of Internet users who have installed Adobe Flash. Although most Web pages are documents, they often don't display consistently from one browser to another, and it can be awkward to navigate through a large document if it's displayed as a series of connected pages on the Web. Alternatively, when individuals want to share documents with each other, they can have compatibility problems. For example, the new .docx format created by Microsoft's Office 2007 can't be accessed by many other programs, including earlier versions of Office. One traditional method to solve both of these problems has been Adobe PDFs, which preserve formatting and can be opened by most computer users. Ary's note: I am using this feature to store documents, which can be referenced in blogs. Documents uploading is unlimited (??) and documents are either privat or shared. Private documents have a URL address for reference in a blog. Nice!